Meanwhile, add the fresh tomatoes, sun dried tomatoes, tomato paste, basil, garlic, olive oil, and a liberal sprinkle of salt and pepper to a blender. Cover & blend for 1 minute, or until smooth. If sauce is too thick, add more olive oil to thin. Taste, and season with additional salt and pepper if necessary. 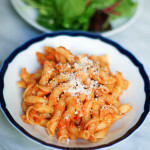 When pasta is done cooking, drain, return to pot, and toss with pasta sauce. Serve immediately, with your choice of cheese on top.